The magic of Christmas exists for those who believe. That’s the theme of The Polar Express, the beloved children's book by Chris Van Allsburg that became a perennial favorite holiday movie featuring Tom Hanks. What Happens on Board the Polar Express? In the story, a boy takes a train journey to the North Pole to rekindle his belief in Santa. 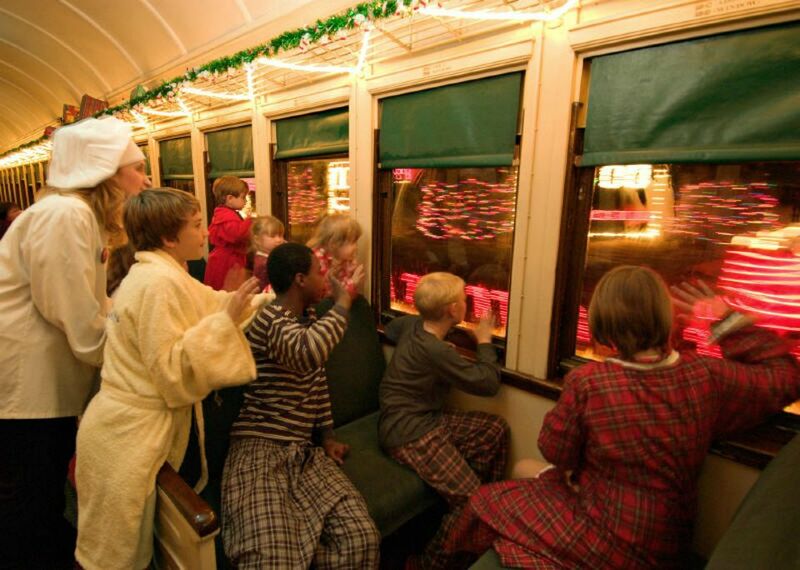 Over the past decade, dozens of Polar Express trains have popped up all over the country, offering families the opportunity to recreate the magical Polar Express experience through readings of the story, music from the ​movie soundtrack, cups of cocoa and, of course, meetings with Santa. Even better, many of these trains operate on historic railways that brim with charm and travel along scenic routes. The revenue from these special holiday trains benefits historic railroads, most of which are not for profit, by helping them raise money to preserve their historic trains. Be aware, however, that while these trains may share many of the same activities, the execution of the experience can vary greatly. It's always a good idea to do your homework and read reviews to see what previous passengers seem to think. How Can You Make the Most of the Experience? Before you go, be sure to read the book and watch the movie so that the details will be more meaningful during your Polar Express experience. All of the trains encourage kids to wear their pajamas, just like the boy in the story. It's fun for the kids and the trains are heated. Many trains offer a variety of seating classes with more expensive options including additional perks, such as a souvenir mug or a keepsake photo thrown in. Always check to see exactly what is included at each fare level. Consider what time of day you travel. Some younger kids may do better on earlier trains, but the last train ride of the evening is arguably the most atmospheric when it's darker outside and so consequently the train cars seem cozier and holiday lights seem all the brighter. How Far in Advance Should You Reserve Tickets? These Christmas trains are wildly popular and seem to sell out faster every year. With well over a half a million pajama-clad passengers climbing aboard each season, some trains sell out before the end of summer, especially those that run only on weekends and select dates. Book early to secure a specific date or time. What Does It Cost to Ride a Polar Express Train? For a family of four with two adults and two kids, count on spending anywhere from $100 to three times that, depending on the seating class you choose and whether you spring for upgrades. Costs for the train rides vary but typically start around $20 for kids and $30 for adults. Many trains offer a variety of upgrades and packages that often include a copy of the book or a souvenir mug, or seats in the dining car so you can enjoy your hot cocoa at a table with table cloths.